In most conversations that I have about our company, a question comes up about the viability of the card market. Aren’t cards going away? Isn’t that market dead? It’s not surprising because that’s the story line in the media, but it’s so completely wrong that I feel compelled to defend it. The simple truth is that cards are a gift, and connecting meaningfully with other people through gifts is not going away. Last year 6.5 billion cards were purchased in the United States. That represents a steady no-growth environment for the last 3 years since we started. No growth isn’t something to celebrate, but it’s not a hemorrhaging market by any stretch of the imagination. What we are seeing is a channel shift reminiscent of what happened to other content businesses since the early 2000s. Online sales are increasing as a percentage of total sales and brick & mortar sales are declining (particularly at specialty retailers). Whereas online sales represent only 8% of total sales today, by 2016 it will almost double to 14% and by 2018 it’ll be 32%. 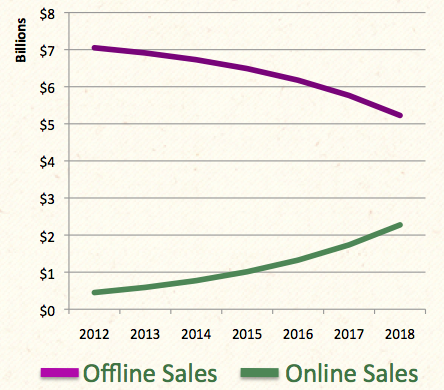 By 2018 almost $2.3B in card orders will be done through the internet if current trends to continue. The average american family buys 31 cards a year. Roughly a third are Holiday Cards, another 1/3 are Happy Birthday Cards and the remaining 1/3 are everyday cards and non-Christmas holidays like Mother’s Day, Father’s Day and Valentine’s Day. Bottom line, the card market isn’t dead. I would rather command a company of Marines than a brigade of volunteers. I’ve spent the last 7 months actively nurturing a community of greeting card artists into existence. Despite my “go big” entrepreneur mentality, it is clear to me now that going slower and developing a small highly-motivated core group of users was vital. Swinging for the fences right away and having a massive but uninterested user base shouldn’t be considered a success. The slow growth has allowed us to work with them personally and has endeared them to our cause. They tell their friends to buy from us, they actively recruit their favorite artists for us and they help each other through issues instead of requesting support. The word of mouth that these users generate is incredible. A full 25% of all our traffic is new direct visits (people typing CardGnome.com into their browser after they are told about us) and 95% of our new artist acceptance has come from word-of-mouth referrals. They are starting to cost us less to support because they take the time to know the system better, and because they ask each other for support on our forums instead of emailing us. They spend more, they cost us less to support, they recruit artists and they find us new customers. I don’t just view this in terms of economics, but they lower our cost of customer acquisition and increase our average lifetime value. If you are just starting, focus on making a few users extremely happy instead of spending money to acquire uninterested ones. One of the lessons I focused on during my recent trip in South America was differentiation. Most of us spend our entire lives trying to fit in and be accepted and yet those that differentiate are the most successful. While not new, it fascinated me that my foreignness drew curious people towards me and got me preferential treatment at bars and restaurants. All it took was saying a few sentences in heavily accented Spanish and they’d be interested in a conversation. Where are you from? What are you doing in Argentina? The fact that I was different, made me interesting immediately, and they wanted to engage. I did nothing to hide my American accent, actually I did the opposite (much to the Chagrin of my embarrassed brother). Visual Branding: Use bold stylistic cues that are different than one would expect from your industry. House Wine, has done this well by taking a completely different take on wine labels. You may not like it, but you won’t miss their bottles when you stroll the aisles. Steve Lowtwait has done an excellent job giving our logo the same special treatment. Trust people: Don’t be overly-protective with your product. Let customers touch it, feel it and play with it. Have you ever felt welcome in a store that prominently displayed signs that said “you break, you buy” or that has metal detectors? No. Websites that force you to sign-up before a purchase or into onerous sign-up processes are the virtual versions of these unwelcoming environments. What methods have you found for differentiating your product?